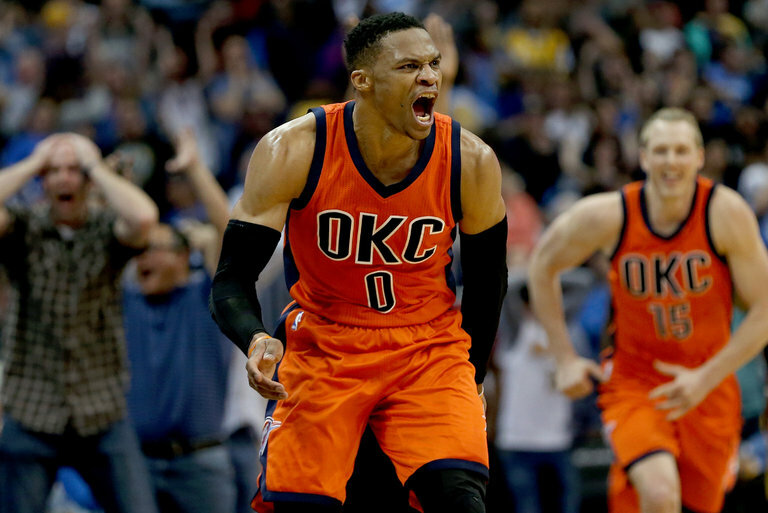 Oklahoma City’s Russell Westbrook reacted after hitting a game-winning three-pointer on Sunday as the Thunder beat the Nuggets. Westbrook recorded his 42nd triple-double of the season to set a new N.B.A. record. Russell Westbrook tallied his 42nd triple-double on Sunday night, breaking the season record set by Oscar Robertson in 1961-62 with the Cincinnati Royals. Westbrook’s 50-point, 16-rebound, 10-assist performance in the Oklahoma City Thunder’s 106-105 comeback win over the Denver Nuggets included a 3-pointer at the buzzer. And it capped a feat that is amazing in many ways — some obvious, some not as much. 1. Going into Sunday, Westbrook was averaging 31.7 points, 10.7 rebounds and 10.4 assists per game. He will be the second player in history to average a triple-double in a season, after Robertson. 2. Westbrook has twice as many triple-doubles this season as any other N.B.A. player. James Harden is next with 21, followed by LeBron James with 13. Entering Sunday, the rest of the league combined had 38.